Sri Lanka’s politicians thrive on their largely finically illiterate electorates as the majority of voters are incapable of understanding the economic realities and the consequences of financial mismanagement of governments, according to an expert in the country’s financial sector. Referring to the Standard & Poor’s Rating Services’ Global Financial Literacy Survey, CFA Society Sri Lanka Advocacy Chair Ravi Abeysuriya highlighted that Sri Lanka has the highest gap between print literacy and financial literacy in the region. Sri Lanka’s financial literacy, which is at about 35 percent, remains well below the 65 percent financial literate in advanced countries, despite having similar print literacy rates. He identified that the lack of financial literacy among the public as a major reason for the mismanagement of Sri Lanka’s post-independence economy. “They (voters) don’t put an effort to understand the economics, even a little bit. Unfortunately, the Sri Lankan voters do not understand the damage that is being put on to them, not only to the current voters but also for the future generations to come. If the people are financially literate, they will push politicians and intuitions to become more financially disciplined,” he said. Abeysuriya yesterday launched a book titled ‘A Beginners Guide to Financial Literacy: To Achieve Your Financial Wellbeing’, at the Institute of Policy Studies, in an attempt to enhance the financial literacy of Sri Lankans to become successful through financial discipline. Drawing examples from his career experience, Abeysuriya said that some of the professionals also lack the financial literacy, as the people get carried away with high returns, neglecting the risk factor. “Financial illiteracy is not confined to the poor; it includes professionals such as doctors, lawyers and judges. Believe it or not, one of the people who got carried away to invest in a hoax deposit scheme was a judge. People get carried away with high returns, forgetting on the risk factor,” he said. Abeysuriya noted that unscrupulous individuals and organisations are thriving on exploiting the financially excluded groups of the country, who give credits to these vulnerable people at a rate as much as 220 percent interest at times. He also pointed out that people also get swayed by various offers they get with credit cards. “So many of you use credit cards but if you read this book, you would be much more careful. The People tend to get carried away with various discounts offered by credit cards,” he said. 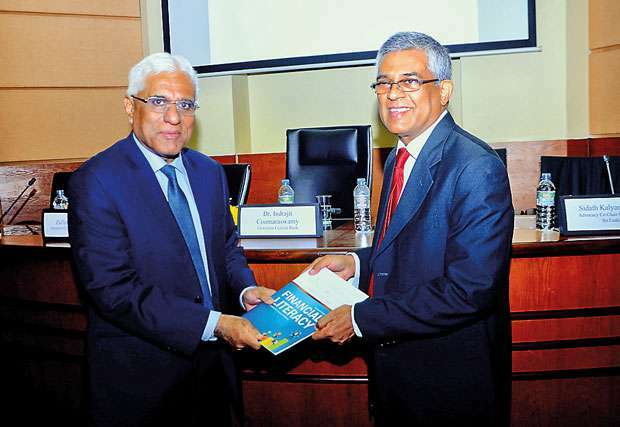 Expressing his opinions on the matter, Central Bank Governor Dr. Indrajit Coomaraswamy said Sri Lanka, which was only second to Japan in Asia at the time of the country’s independence, on most socio-economic indicators, is lagging behind today and a main reason for that is the lack of fiscal discipline. He blamed the populist policies and the entitlement culture of the Sri Lankans and the irresponsible spending by the state, which are results of lack of financial literacy of the public. “Due to lack of understating, we don’t realise that we have been living beyond our means for most of last 70 years. We were able to live beyond our means because of funds at very concessional terms and survived,” Dr. Coomaraswamy noted. However, he stressed that Sri Lankans are no longer able to continue this trend as the country can no longer depend on concessionary loans and grants as Sri Lanka has now reached the lower-middle income country status. Dr. Coomaraswamy asserted that Sri Lankans need to come into grasp with the realities as the country needs to be more fiscally responsible. With a PM and his party standing for his rights , we will not have a democracy nor country to live in.